Here at Gary A. Zucker & Associates, P.C., we believe that all motorists should be responsible and held accountable for their actions. When someone on the road causes an accident to occur, we will be sure to seek just compensation, whether they hail from Brooklyn or one of New York City's other boroughs. Our auto accident attorneys will always fight for the rights of victims and their families because we believe in aiding in the road to recovery. While motorcycle riders tend to be more vulnerable than other motorists on the road, their actions can be quite irresponsible and lead to major accidents and injuries. This is particularly true if they engage in lane splitting. Let's look at that action and why it's so dangerous. Lane splitting refers to the practice of riding between lanes in the middle section of the road along the lane divider lines. This is possible to do given the size of motorcycles and their maneuverability, but obviously it is not advisable. Why do some motorcyclists engage in lane splitting? Many motorcyclists lane split in order to get around traffic and busy portions of the road. You may see this happen a lot on city streets when cars are stopped and lanes are clogged and congested. Motorcyclists or people on scooters sometimes carefully make their way between the cars to get further up the road. The same thing can happen in highways whether they are busy or not. Is lane splitting legal to do? In some states yes, but lane splitting is illegal in the state of New York. When a motorcyclist weaves between vehicles or drives between vehicles, the motorcyclist puts himself/herself and others at risk. The motorcyclist may get sideswiped by the adjacent vehicle, which is especially risky given that they are often in the blindspot of other vehicles. If a motorcyclist tries to thread the needle between two cars, this can be especially dangerous, and the motorcyclist runs the risk of getting pinched between cars. Even in traffic among stopped vehicles, lane splitting is a bad idea. A motorcyclist runs a risk of hitting rearview mirrors or scraping the sides of vehicles if the space between lanes becomes very narrow. There's also a chance of getting doored by stationary vehicles, which can be especially injurious and lead to major damage of both vehicles. In short: Traffic or no traffic, just don't do it. Given that lane splitting is illegal, it's important to our team that any motorcyclist who engages in the activity is held responsible for these matters when accidents occur. We will be sure seek compensation to cover any damage to your vehicle as well as medical bills if the lane splitting resulted in a serious accident. We share the road, and it's important that everyone share fairly and legally. 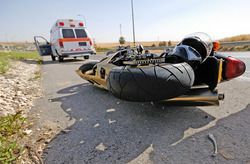 If you would like more information about motorcycle accidents and how our legal team can help you with these sorts of cases, we encourage you to contact our personal injury law firm today. The legal team at Gary A. Zucker & Associates, P.C. will be here for you in your time of legal need.